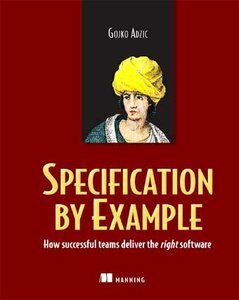 I was lucky enough to be a reviewer on Specification By Example by Gojko Adzic, and the final version was recently released to print by Manning. And I was stoked to see not only my name in the acknowledgements, but that my quote made it to the cover of the book. The following is my brief review and notes from the book. “I love this book. This is testing done right.” That is my quote on the back cover of the book, and I meant every word of it. Having been a quality advocate in the agile space for a few years now, this is the first book I have read in a long time which had me nodding my head all of the way through, as it resonated with my ideas on how development teams need to reconsider specifications and testing. The book starts out by summarising why specification by example is so important and outlines some key patterns for success and then, through examples throughout the book, steps through the patterns pointing out the warning signs along the way. The key steps are to ensure the culture is fit, then approach specification in a collaborative manner, use examples and automate and finally evolving a living document / specification. I really appreciated the fact that the examples were not just the run of the mill greenfield Java web applications that are used in most books. There is a good sampling of different organisations, most of which are using this technique on existing legacy applications on a variety of different platforms. The book is an easy read for the entire team, which means it can (and should) be required reading for the developer, tester, analyst and project manager. I have encouraged many of my teams to take a look at the book, and a couple of my colleagues have indicated this book helped convince and reinforce why this approach is so valuable. My only concern when reviewing was the fact that the title of this book may not standout to testers and developers (not perhaps as much as Acceptance Test Driven Development or ATDD might). Currently the community has a number of similar approaches with similar names, although I must acknowledge that the specification by example tag has grown on me over the last few months. The book does not expend much effort talking about tools in this space, by design, I think this fact makes the book more readable and accessible to a wider audience, but that said it suggests to me that there is still a gap for a good text that matches specification by example to particular tools like Concordion, Fitnesse and the like. Overall, this book is a definite must read for any teams (particularly agile teams) who are trying to balance or find a decent approach to specifications and testing. It is a good balance of patterns and real case studies on how testing and specifications should be approached in an agile world. It would make my list of Top 5 must read testing books and Top 10 must read agile books. And now I know what the proper name is for the cats eyes that are embedded in the freeway! understanding why something is needed, and who needs it, is crucial to evaluating a suggested solution. one of the best ways to check if the requirements are complete is to try to design black-box test cases against them. If we don’t have enough information to design good test cases, we definitely don’t have enough information to build the system.